Regular maintenance generally means a once-a-year cleaning. To keep the fabric looking fresh, the fabric should first be hosed down to remove any loose debris. Using a soft brush with a mild natural soap like Ivory Flakes or Woolite in lukewarm water, no more than 100 degrees F, remove any loose dirt and stains from the fabric. Do not use detergent! Rinse thoroughly to remove all the soap from the fabric. Soap left on the fabric will leave marks and a chalky residue. Allow the fabric to air dry before retracting. Do not allow water to puddle on the fabric. With a broom, brush off all loose debris before cleaning the fabric. Clean the fabric from the bottom and work your way up. Wash all parts of the awning – Missing spots show when the fabric is dried. About once a month rinse your awning down with a garden hose and keep the underside clean by simply brushing with a household broom. Keep shrubbery and vines trimmed away from the awning, they contain acid that can damage fabric. In addition, check awning frames for rust. Though rust is not likely, it can cause deterioration of the frame and lead to fabric stains. Turn the gear with the supplied crank handle in one direction to extend awnings or lower shades. Turn in opposite direction to retract. Crank handle should be held at the same angle as the eyelet when operating. The lateral arms will be flexed, but locked, at the elbow when fully extended. This is normal. They will never fully straighten out. Trying to do so will damage the awning. When you open your awning, be careful not to roll the fabric out past the gear stops where the elbows lock out and the fabric begins to sag. If this happens, roll the awning back until the fabric becomes tight again. Retractable awnings are intended as protection against sun only. Do not use in strong wind, rain, hail or snow. 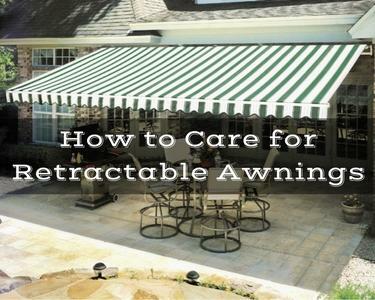 We recommend that patio awnings be and remain retracted in wind speeds of 20 mph or greater. Do not allow twigs or leaves or any other solid debris to be rolled up in the awning. When retracting, do not jam the front bar tight against the rolled fabric. The fabric should always roll off the top of the roller tube and never from underneath. The aluminum components have a durable finish and the joints are self-lubricating. Your product is designed so that maintenance is not normally required. However, it is a good idea to hose off the framework and wipe it with a soft cloth at the start of the outdoor season. Lubricate the moving parts yearly with a dry silicone spray lubricant to maintain optimal, quiet operation. If unusual cracking occurs when operating, try lubrication before calling your dealer. The most prevalent place where an awning needs lubrication is at the end of the roller tube, on the side opposite the motor or gear. A bit of spray lubricant on the axle/ bushing at this point eliminates almost all squeaking noises. Be sure to keep the spray away from the fabric. Retract the awning or canopy for winter. If your awning has a hanging valance, remove it by sliding it out from the front bar. Put it in a well ventilated dry area where it won’t be bothered by squirrels or mice. Don’t store it in a plastic bag as this will trap moisture and could produce mildew.